A Starck-designed hotel to go into Mies’ (former) IBM Building in Chicago? Phillipe Starck’s firm in Paris confirms they are doing work at 330 North Wabash in Chicago. The former IBM building. A great work, with a great lobby, one of the last by Ludwig Mies van der Rohe. The design work for the New! Improved! lobby was started by S+arck Network, and then continued by Niedermaier of Chicago. DeStefano + Partners is also involved. Yes, there is talk of a Starck-designed hotel to go in the building. I wasn’t (yet) allowed (by building security) to photograph the pieces. But here’s what it looks like through the glass. The gentleman caller is sitting on three Mies daybeds, made into one, and bronzed; the cushions are hard, and gaudy. They’ve also bronzed some Barcelona chairs – the steel and the cushions, all bronzed! The over-sized, overly bright and the wrong color light, elevator signs. So over-sized that they’re easy to photograph through the lobby glass. And gaudy. Nice photo, huh? Collage-like. Mies’ glass still creates works of art. But is this style, “The New Gaudiness”contagious? Remember, Trump Tower Chicago is across the street. That green cylinder in the photo above is Trump’s parking ramp. We also find “The New Gaudiness” across from Mies’ Federal Center in the lobby of the tower called Dearborn Center by Ricardo Bofill and, once again, DeStefano + Partners. 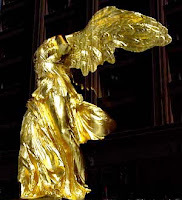 In that lobby you’ll find a gilded Winged Victory! The IBM lobby was so classy, so dignified; and the IBM Corporation took such good care of it. Walking past it every day on the way to work at NPR-Chicago, which was nearby, across the river in the great Carbide-Carbon Building, (now a Hard Rock Hotel!) is how I came to love Mies. That lobby worked its magic on me. Different every day, at all times of day. Filled with light and air. Sumptuous materials divinely proportioned. That’s enough for me. A smart friend of mine, with impeccable design sense, who works in 330 North Wabash, swears he’s going to put a blindfold on the bust of Mies in the lobby, so the ol’ guy doesn’t have to look at what they’re doing to his Meisterwerk. I posted more on this building here. More photos too. In the lobby of the old IBM building you will now find bronzed Barelona chairs and bronzed Mies daybeds. DeStefano & Partners is “renovating” the lobby, but is it true, as I’m told, that Philippe Starck designed this lobby furniture? And that it’s his tongue-in-cheek take on Mies? And that the building is considering putting a hotel in there? That could also be designed by Starck. Well, we know the building is running scared, now that many of its views up the river are blocked by the ever-rising Trump Tower. Many tenants are leaving IBM, which is now known as 330 North Wabash. The owners are also thinking of taking the building condo. Okay. But in the long run they’d be better off honoring their heritage, rather than defacing it to supposedly make it more suitable to contemporary tastes. The signs that tell which floors the elevators stop at have also been changed – the original pieces – beautiful and perfectly good – have been replaced by new signs that are too large, too gaudy and the wrong shade and tone. I hope they saved the originals. Caulk has been placed in the famous Mies corners of the travertine, destroying his interesting connection and philosophically profound meeting of two planes. In Mies’ buildings especially, the details are important and are a part of the whole. At least a couple of the forward thinking design firms in the building have complained to the management about this misplaced “updating” of a masterwork. You are currently browsing the archives for the Starck category.